We accept pay pal but you must add the 3% service fee! 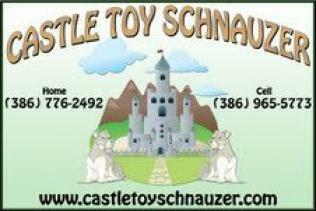 Welcome to Castle Toy Schnauzer the home of quality loved and raised puppies. I have been raising puppies for many years, but was destroyed in Hurricane Katrina. We have relocated in Live Oak, Florida on 20 acres. We had a beautiful Kennel Building made with air and heat. We have 14 individual runs with automatic waters. All of our dogs are loved and well cared for and have been selected carefully for breeding. We breed for quality, conformation,sweet loving natures( no inter breeding in our dogs). Please go to our puppy page for available pups. We breed the smaller size Mini Schnauzer, Toy, and Teacup. Schnauzers are loving people dogs that do not shed so make a great dog for allergy suffers. I SPECIALIZE IN THE RARE COLORS, BUT OCCASIONALY HAVE THE OTHER COLORS OF BLACK, SALT AND PEPPER AND BLACK AND SILVER. ALL OF OUR PUPPIES ARE AKC REGISTERED AND SOLD WITH A SPAY/NEUTER CONTRACT. I WITHHOLD THE PAPERS UNTIL I AM FURNISHED PROOF OF SPAY OR NEUTER. I WILL SELL FULL BREEDING RIGHTS FOR AN ADDITIONAL PRICE TO A SELECT FEW BREEDERS.